This electronic project prevents incorrect connection of polarized sources in circuit and is designed using common electronic components. Safety of polarity from the diagram below was dimensioned for a voltage of 12 volts. When connecting correctly voltage to terminals 1 and 2 through RE1 resting contact, diode D1 and the coil current flows once the switch closes the circuit (relay closing, established by contact or connection with device connected). 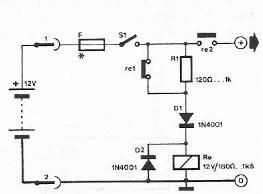 When you connect the wrong polarity of power supply, diode D1 is blocked, the relay no longer closing and power is interrupted device. R1 resistance reduces current flowing through relay coil connected in the state, so that losses to be minimal (the resistance should be chosen according to characteristics of the relay).